Where is the Motor Parkway? 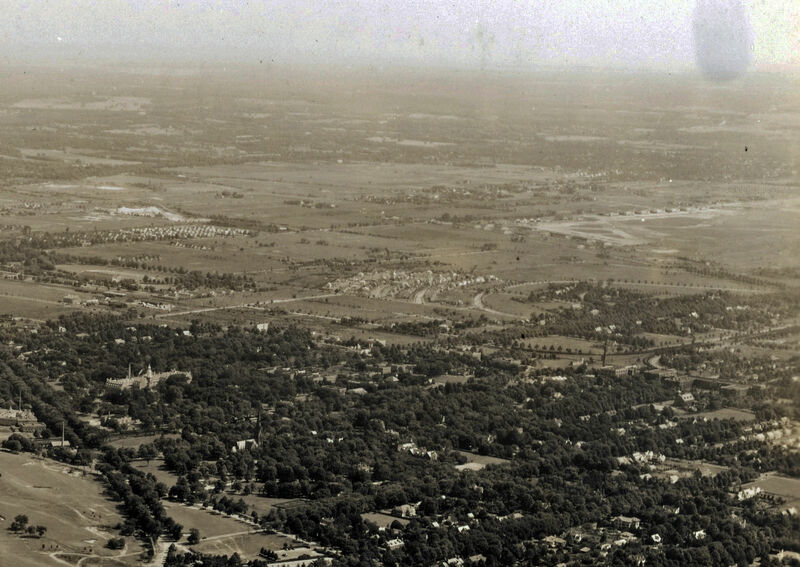 A bit hidden, the Motor Parkway can be seen in the upper left to the right center of the aerial (from around Jericho Turnpike to the west section of Roosevelt Field airport). 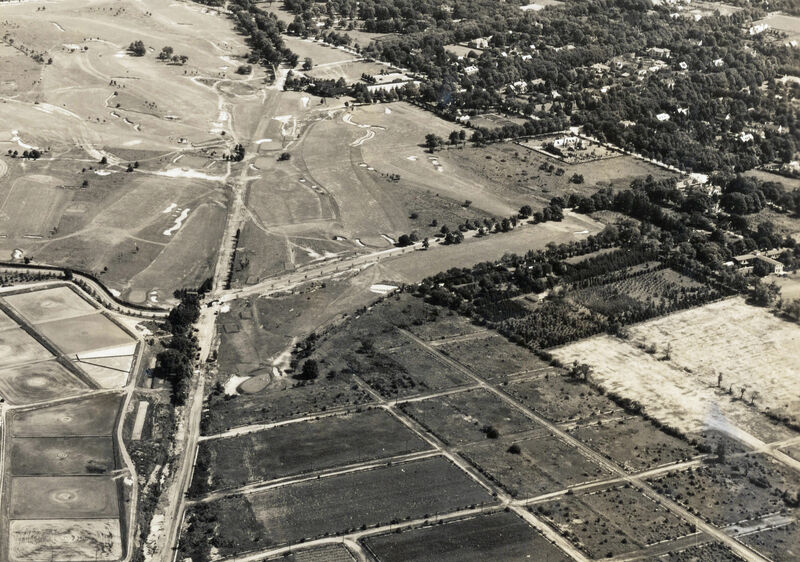 See images C & D.
Which Motor Parkway structures are hidden in this aerial? 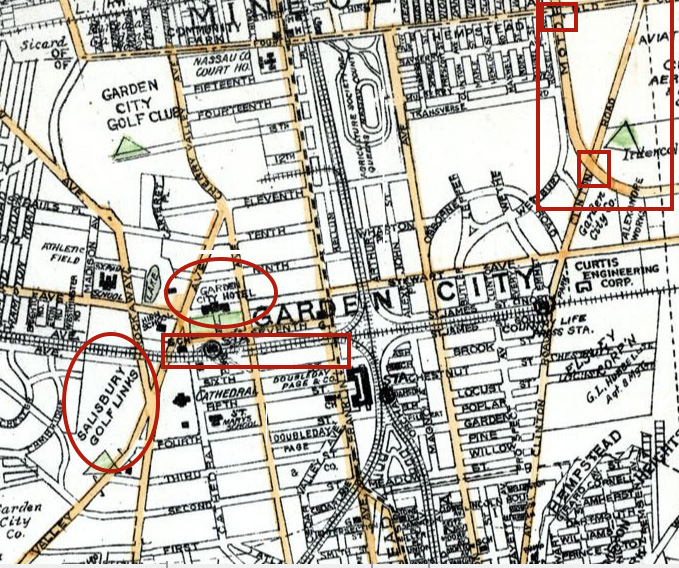 Motor Parkway bridges (from top to bottom):Westbury Avenue, Jericho Turnpike, Mineola LIRR, Old County Road and "Mayan Ruins"
The Garden City Hotel was the headquarters for the Vanderbilt Cup Races from 1904 to 1910. 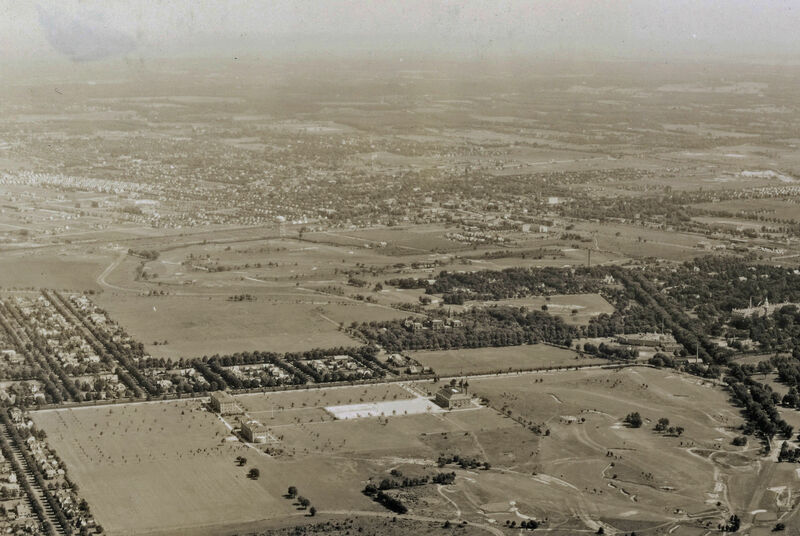 See image F.
Cherry Valley Club (Images A & F) and in the northern background Garden City Golf Club (Image B). Where is there a train in the aerial? A LIRR train can be seen leaving the station in front of the Garden City Hotel (image E). 1936. 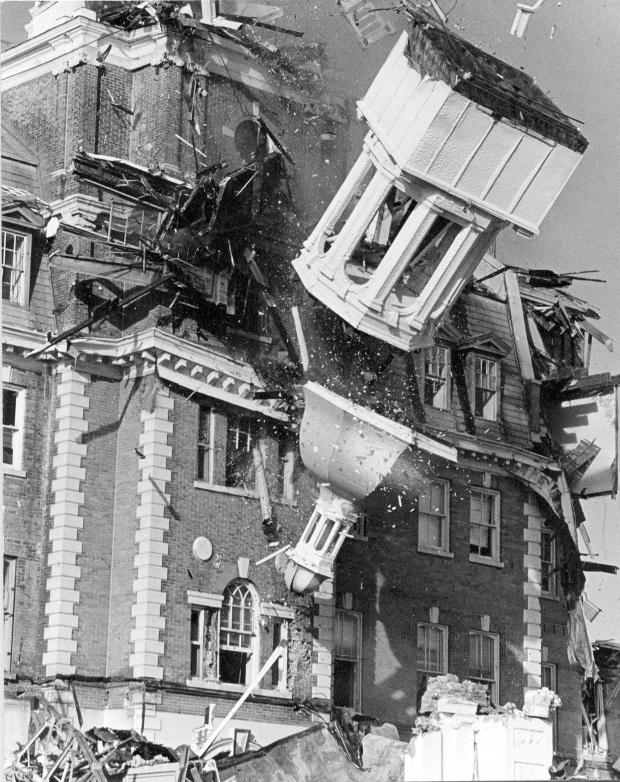 Rationale: The inital buildings of Adelphia College/University -ground-breaking in Garden City in 1928 (Image B). The early development of houses in the Mott section (Image C). Congrats to Greg O.,Dave Kilkenny, Steve Lucas, Roy Warner, Lee Chambers, Art Kleiner, Brian McCarthy, Robert Stambaugh, Frank Femenias and Frank Mendyk for identifying Garden City. Kudos to Richard Panchyk for forwarding all the amazing Mystery Foto aerials! A. 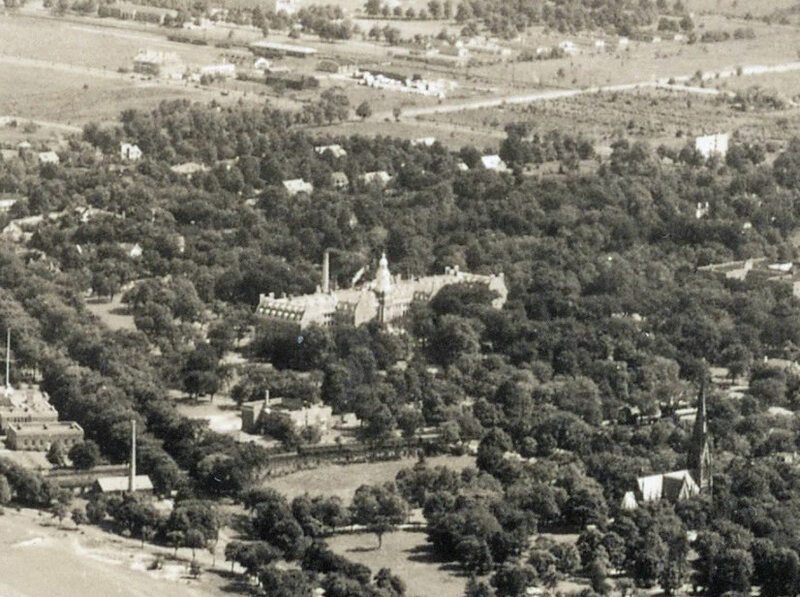 Early buildings of Adelphia College and the Cherry Valley Club. Check out the train in front of the hotel. Frank Femenias: This image posted 3 1/2 years ago continues to haunt, but it was an excellent capture. Five stars for the capture, 0 stars for the cause. 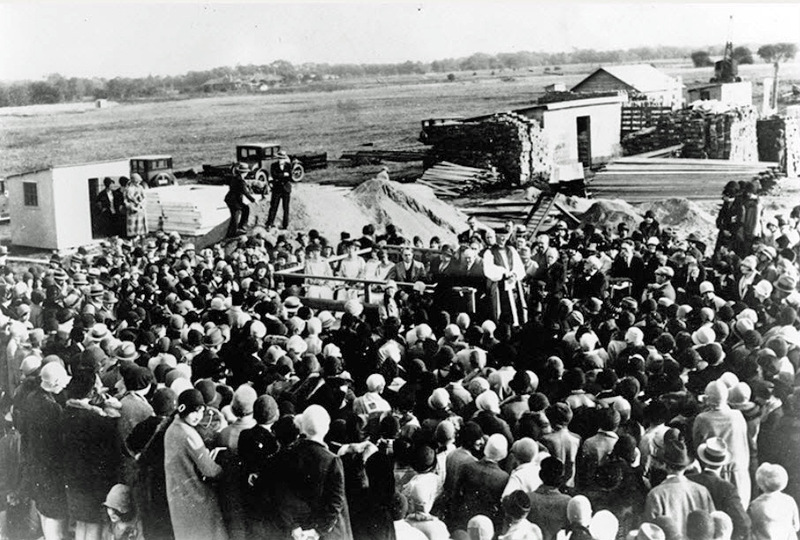 Ground-breaking ceremony for Adelphi in 1928. -Looking North East Over Garden City. Roosevelt Field just visible in the very upper right hand corner. -Along the top and top right of the photo. Roughly around Searingtown Rd all the way to just after the Managers’ office off of Clinton. -Tough to see any of the bridges, Mgrs house, or toll lodges, but Graves garage and Krug’s are also within the photo’s frame. Another great shot of Garden CIty! The photographer is over Garden City South looking northeast across GC and Mineola. 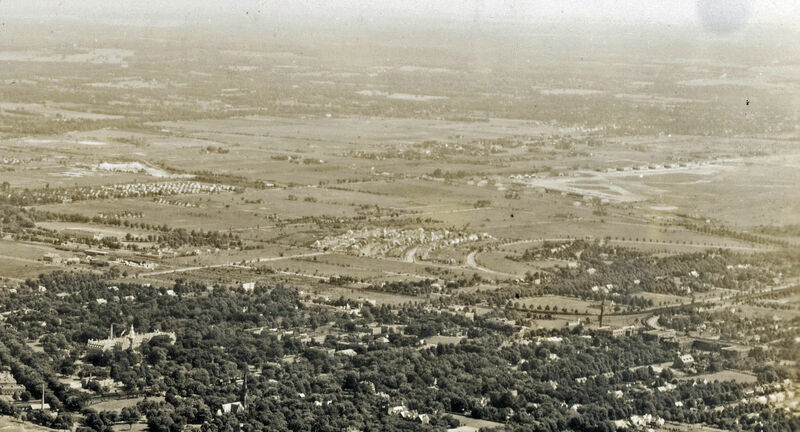 - The Motor Parkway is in the very top right of the picture, best seen by close-up C in the top right of the image. The road is coming from the north, crosses over Jericho Tpke, Old Country and bends over to Clinton Rd where you just make out the GC toll (or not). - Major roads include Stewart Ave and South Ave, Rockaway Ave and 1st Street. Others include Franklin Ave, Washington and Old Country in the distance. - The course in the foreground is the Cherry Valley club and the Garden City Club off in the distance. - You can just make out the train thru the trees pulling into the Graden City Station on the Hempstead line. 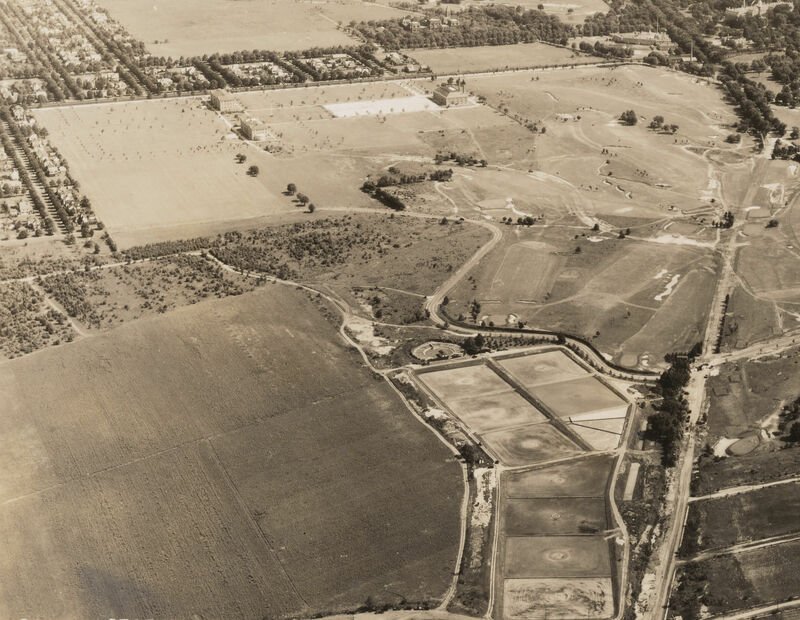 - I would put the date of this aerial around 1937 since the Mott section is in its very early infancy. We are over Garden City looking northeast. While difficult to see, the LIMP runs north-south from the upper left to the right center of the photo. LIMP structures that while hidden from view, should be in the photo are: Clinton Road bridge; Garden City Lodge; General Managers office; Mayan ruins; Mineola Lodge (kiosk) and Old Country Road underpass. Additional roads are: Cherry Valley Ave.; South Ave.; Stewart Ave.; Cathedral Ave.; Westminster Ave.; and Franklin Ave. Also visible is the Garden City Hotel, headquarters for the Vanderbilt Race Commission from 1904 to 1910. The Cherry Valley Country Club is in the foreground with the Garden City Golf Club in the distance. The train is at the Garden City station just below (south) of the hotel. 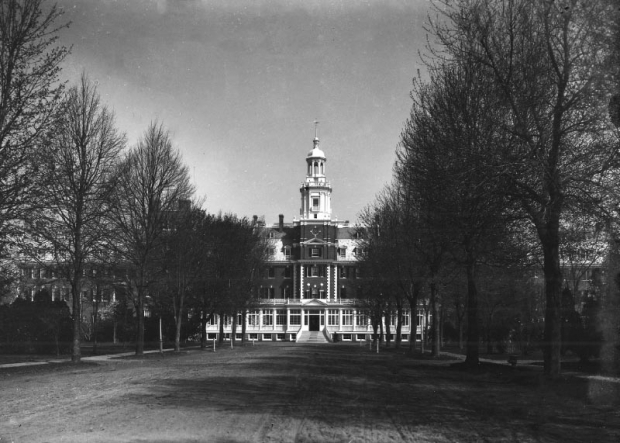 Since there appears to be no activity or any cars at Adelphi College, the date could be 1929 just before the first classes were held there. I’m pretty sure that the photographer is looking northeast over Garden City, and that the large building is the original Garden City Hotel that eventually burned down and was rebuilt to the modern facility that it is today. I think that I can make out the southbound Motor Parkway and its curve to the east, which was very near what is Roosevelt Field and its parking lot somewhat north of Stewart Avenue today. I’m guessing that the row of structures running from the west to the east, which look like airplane hangers, were part of an air field; which one, I don’t know, given that the real Roosevelt Field was to the east. Main aerial photo is over Garden City, facing NorthEast. In photo C, the hangers along Old Country Road can be seen in the top right corner. Clinton Road runs perpendicular to it. 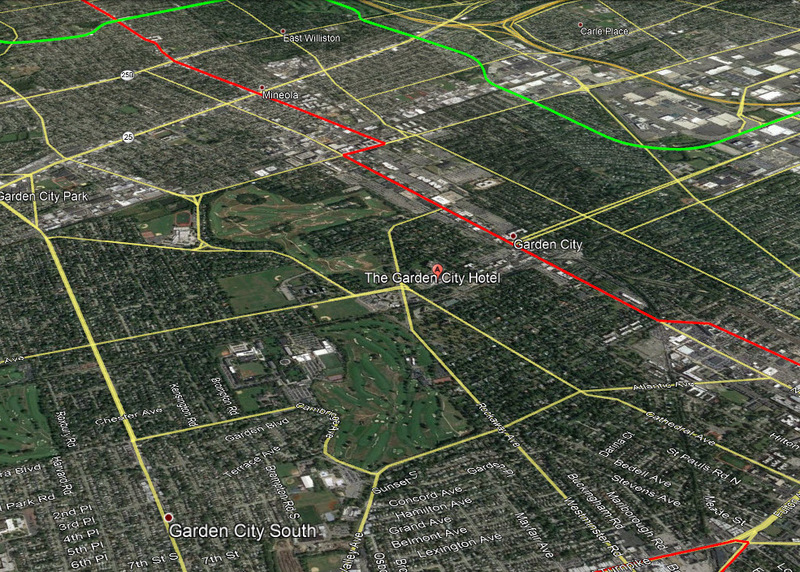 The LIMP runs parallel to Clinton Road until it veers 90 degrees to the East through what will become Roosevelt Field. Photo D shows more detail of the runways at Roosevelt Field. The train can be seen on the lower left corner of the shot as well as in Photo E.
Where is there a train in the aerial? Train is between Garden City Hotel and St. Mary’s School/Cathedral in Pic. E.
Yes, another great aerial courtesy of Mr. Panchyk! *Location/Orientation: Birds Eye View of Garden City, NE direction. *LIMP/Structures: The pkwy is best viewed within Closeup D. Pkwy proceeds east from the middle of this closeup, then curves to the north. Garden City Lodge & Managers Office, Clinton Rd Pkwy Bridge, “Open Bridge” ( Mayan Ruins ), Old Country Rd Hwy Bridge, LIRR Mainline Pkwy Bridge, Westbury Ave Pkwy Bridge ( hill like ). *Major Rds: Clinton Rd. Washington, Franklin, Hilton, Cathedral, Cherry Valley, Rockaway, and Stewart Avenues. *Train: Just E/O Cherry Valley Ave.
*Aerial Date: I’ll guess 1933. Adelphi College established in Garden City 1929. I see buildings on the campus property to the left of Cherry Valley Country Club. Much more in this aerial. No desire to burn the Midnight Oil. Primarily of the Village of Garden City and the area to the east and north. Garden City Hotel and cathedral in center of picture ‘E’. 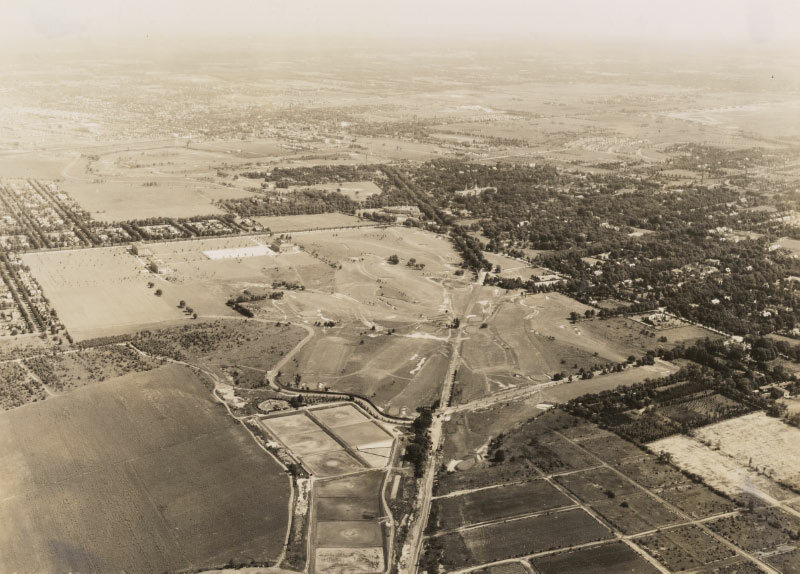 Picture ‘D’ shows hangers along Old Country Road in the distance and Camp Mills area north of Transverse Road and the ‘arched’ streets east of Franklin Road. Train is pulling into Garden City in picture ‘B’. Cherry Valley Golf course on picture ‘A’. Motor Parkway cuts across picture ‘C’ from Mineola over to Clinton Road. - Major Roads, Cherry Valley Ave, Cathederal Ave, Rockaway Ave, Washington Ave, Old Country Rd, Clinton Rd, Franklin Ave and South Ave.
LIRR mainline, LIRR Hempstead branch Stewart RR , LIRR Central, Central branch or etc.